Arthur “Big Boy” Crudup shares with Robert Johnson and some other blues greats the unfortunate fact (from a blues-centric perspective anyway) of being known today primarily because of their influence to rock stars. Johnson is known for his influence to Mick Jagger and the Rolling Stones as well as Eric Clapton and Cream, while Crudup (pronounced “Crude-up”) is remembered for his influence to Elvis Presley. Presley recorded three of Crudup’s songs, most famously, “That’s All Right,” which was his first commercial release on Sun Records in 1954. By that time, Crudup’s fame in the blues world was actually ebbing, but he enjoyed substantial popularity, mostly among blacks, between 1941 and the early 1950s. The native of Forest, MS, arrived in Chicago sometime in the later 1930s and did not find life easy there. He apparently lived in a packing crate under the 39th Street L for at least a short time. Success on the Bluebird label did not translate to riches though it was helpful to him. Neither did “That’s All Right” generate money for him, and he wasn’t able in his lifetime to collect royalties. The question of whether Crudup really wrote the song is a fair one. I’m not an intellectual property lawyer, but I can safely say that the title verse of the song is drawn directly from Blind Lemon Jefferson, from a song called “That Black Snake Moan” recorded in 1926. Jefferson was immensely popular and Crudup undoubtedly knew his songs. Many of Jefferson’s songs have no coherent story or idea in them. Writers have used terms like “athematic” or talked about “stanzaic disjunction” to describe songs whose verses seem to have nothing to do with one another in any logical way. Many memorable Jefferson verses would be adopted by later blues players and used to build a song that did actually tell a story or have a central idea to it. The title verse of “That’s All Right” was also sung at Carnegie Hall by Big Joe Turner in 1938’s “From Spirituals To Swing” concert, where the song was called “It’s All Right Baby,” so it was certainly around before Crudup’s 1946 recording that Presley covered. Still, Crudup’s story and additional verses for the song seem to be his own. Still, any record producer would desire more variety and a break from the steady stream of slow-tempo laid-back songs Crudup offered. Producer and Delmark Records owner Bob Koester says as much in some studio chatter that is actually shared with us on the album. Crudup likens himself to a car with a cold engine. “You ain’t got no anti-freeze in your car, and it’s about froze up.” Koester replies that there is some anti-freeze right by Crudup’s chair, surely a reference to some sort of booze. That doesn’t work for the bluesman. He tells Koester that a faster song just isn’t in him that day, and tolerantly accepts Koester’s frustration without getting angry – or giving him what he wants. Crudup: See What I Mean? One certain factor in his mood was the recent death of his wife. Crudup was obviously still in a fresh state of mourning at the session. 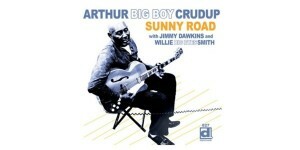 On the last song, “All I Got Is Gone,” Crudup clearly has just been crying. Though the album does not offer much variety in tempo and texture, there are some noteworthy guest appearances by guitarist Jimmy Dawkins (who died April 10, 2013) and some good drumming from Willie “Big Eyes” Smith, as well as the previously mentioned use of the Leslie speaker with Crudup’s guitar. Crudup’s singing is deep and soulful, and I must warn you that his clearly distressed and saddened state is quite communicable when you are listening to this record. It is far from the ideal of the perfectly crafted and sequenced LP that almost all record producers want, but it’s the blues, deep as it gets, available at long last from the great Arthur “Big Boy” Crudup.